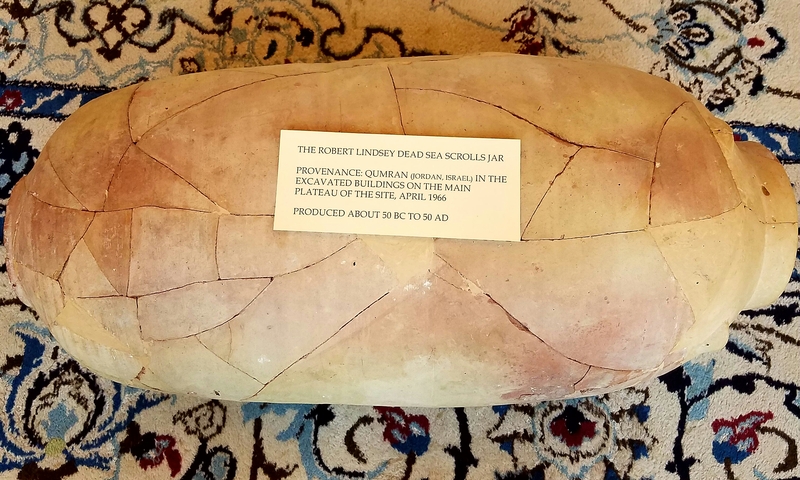 On March 24, 2017 the Lanier Theological Library put on display its own authentic Dead Sea Scrolls jar, centered in the main hall, just left of our original DSS fragment of Amos. It is not a replica or facsimile, but it is approximately 2,000 years old, having been produced between 50 BC and 50 AD. It is the only such jar in private hands in the United States, one of only four worldwide, with the others in Norway, England and Bethlehem. It was excavated by Dr. Solomon H. Steckoll, a South African archaeologist, in April 1966. He found its pieces in one of the buildings on the main plateau of the Qumran site at the edge of the Dead Sea. He later restored the jar in a preliminary way and entrusted it to Dr. Robert Lindsey as collateral for a personal loan. Lindsey was a pastor at Baptist House in Jerusalem for 42 years (1945-1987). (Lindsey’s own private library is in our main hall at the west end.) In the early 1970s, when Steckoll was unable to pay back his loan from Lindsey, he assigned ownership of the jar to Lindsey to settle the debt. Lindsey kept it in his East Jerusalem home and sent it to the USA along with other possessions shortly before he left Israel on May 18, 1987. 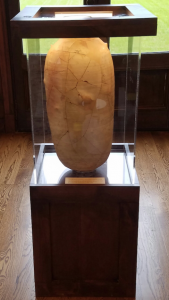 In 1990 he commissioned George L. Kelm of Southwestern Baptist Theological Seminary in Fort Worth to improve on Steckoll’s original reconstruction of the jar in their archaeological laboratory. In 1992 Lindsey gave the jar to his daughter Lenore Mullican and her husband Ken who held it until this library took possession. So, this invaluable jar has been in the Lindsey family for about 45 years. Its provenance is substantiated quite well, according to Weston Fields, Executive Director of the Dead Sea Scrolls Foundation, perhaps even better than the other three scrolls jars in private hands. The opening at the top of the jar is 5 in. wide. Its height is 23.7 in., diameter is 11.8 in. and circumference is 36.6 in. Especially interesting features of this jar are its 4 “handles” at the top, each with a hole drilled in it. Strings were threaded through the holes on opposite sides and tied over the lid to hold it on. We do not have the lid, but we do have one of the original “handles” with a hole. The other 3 were reconstructed by Kelm. The shape of this jar identifies it as a scrolls jar, and it is what William Kando of Bethlehem calls “the large kind,” in contrast to the jar in Norway, which is “the small kind." We are very grateful to Weston Fields for providing this information about our Qumran jar.